"Your Curtis Snowmobiling Adventure Starts Here"
Welcome to the Sleepy Eyed Goose Resort and our Curtis MI Snowmobiling information page. There is nothing like the snowmobile trails of Michigan's Upper Peninsula. 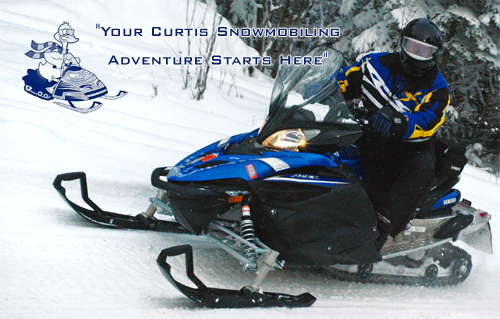 Here you will find the information you need for your Curtis winter vacation - great lodging, maps and our Curtis MI Snowmobiling trail report. 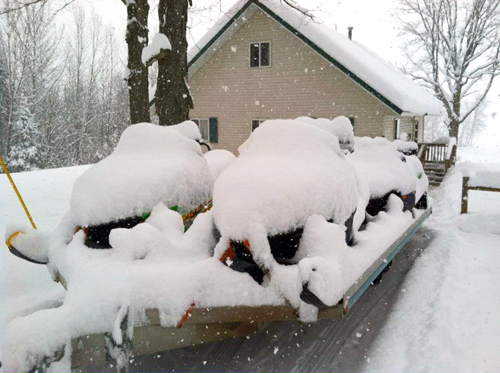 Its Pure Upper Peninsula Snowmobiling at its best. Ride right from your cabin! Sleepy Eyed Goose Resort has a great variety of Curtis MI snowmobiling lodging and cabin rentals for your winter vacation needs. 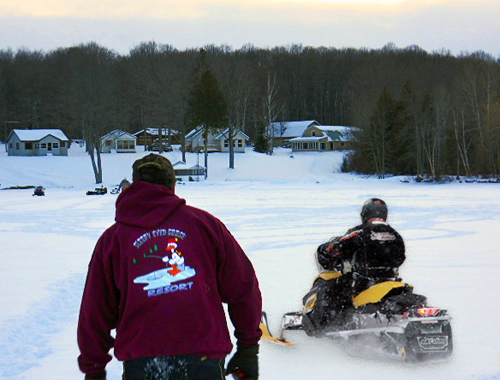 Our snowmobile cabin rentals allow our guests to ride from the cabin door. We have cabins that can sleep up to 10 people comfortably - perfect for your whole family or a group of friends. "First of all I just wanted to tell you, thank you very much for putting up with my ‘crew’ during our stay at the Sleepy Eyed Goose Resort. Your hospitality is top notch. We all feel that we made new friends with you two and all of your friends that we met during our stay. I have been planning yearly snowmobile trips to the UP for the last five years. We have covered pretty much all of the UP and by far your resort was the most accommodating yet and the price was right. The cabin that we stayed in was very clean and felt like a home away from home. The pole barn was a really big hit with all of us as well. We really enjoyed all of the evenings that we spent with you and your friends in the pole barn. Unfortunately, we had to utilize the pole barn for some unforeseen repairs as well and could have not asked for better accommodations for the repairs either. The trails in the area are top notch as well. Hundreds of miles of well groomed trails! I would recommend your resort to anyone that may be looking for place to stay for a snowmobile trip in the UP. I will be talking to you soon to reserve another block of time for next season." — Mike and Lori Bullis.